Sometimes your family tree research can uncover uncomfortable secrets. Growing up, my mother had a cousin who was her dear friend. But she had no idea how they were cousins. My mom would tell me, "Oh, she's a Saviano, but I don't know how." I spoke to my mom's 3rd cousin. 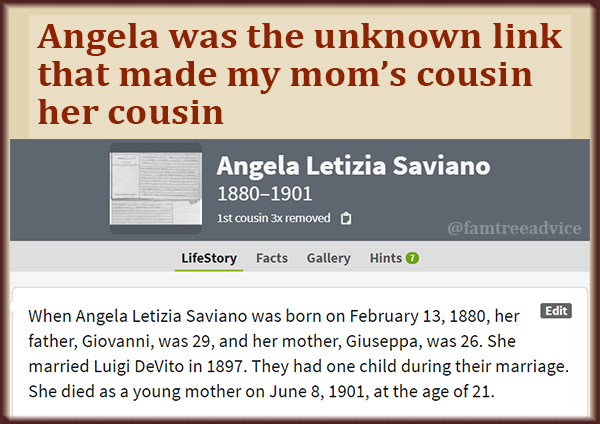 When this cousin asked me to look into her family tree, I learned about her tragic grandmother, Angela Letizia Saviano. On 21 May 1898, Angela sailed from Italy to New York. She was with my great great grandfather, Antonio Saviano, his wife and 2 of his children. Angela was 18 years old and from the same small town as my Saviano family. She listed another of Antonio Saviano's children as her cousin. 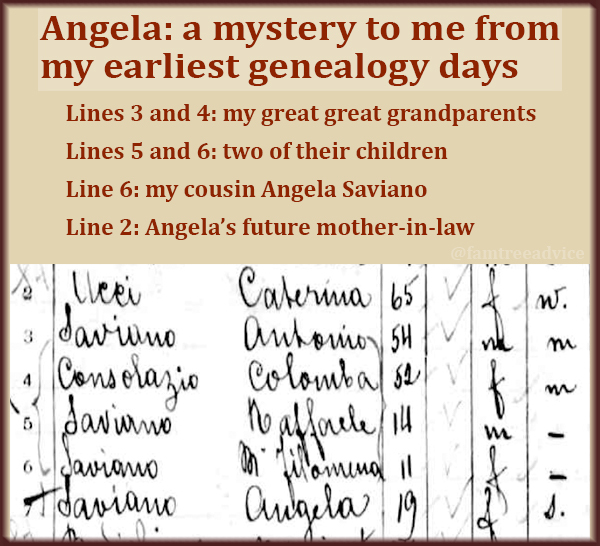 Antonio Saviano was her uncle; Angela's grandparents were my 3rd great grandparents. Angela's 1880 birth record shows that her mother had the same last name as my grandmother. Was she a double cousin? Angela married a man from the same little town, and her mother-in-law was on that ship in 1898, too. Angela had one child, a daughter Catherine, in New York City in 1899. Angela died at the age of 21 of a leaky heart valve. She'd been under a doctor's care for 1 month. 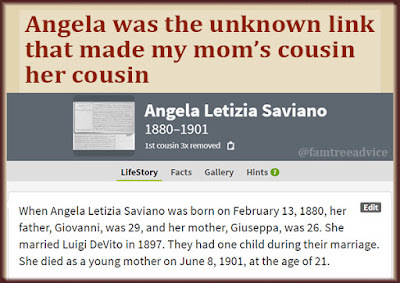 Angela's only daughter is the reason my mom's cousin "was a Saviano". Angela was this cousin's grandmother. One of my 1st genealogy finds had the mysterious Angela. Last week this same cousin asked if I'd found out anything about her father's side of the family from Bari in Italy. I can do that research now. 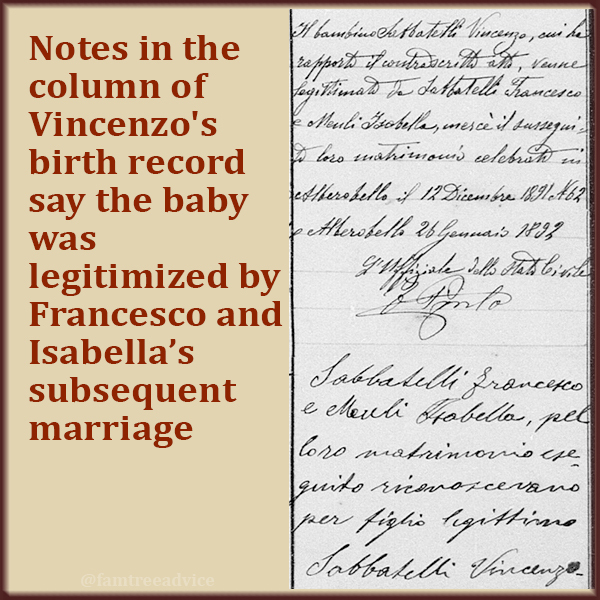 With online access to Italian birth, marriage and death records, it should be easy. (If you have any Italian ancestors, find out about the Antenati site.) I started by looking at the U.S. documents I'd collected for my cousin's father and his brothers. I had their names and approximate ages, their father's name (Francesco), and their hometown (Alberobello). I searched the Alberobello birth records for the 3 brothers and found them all. Now I knew their mother's name was Isabella. 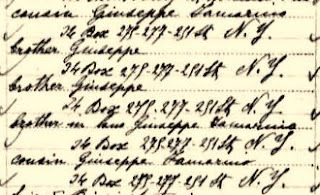 But there was something unusual written on the side of the first-born son's birth record. 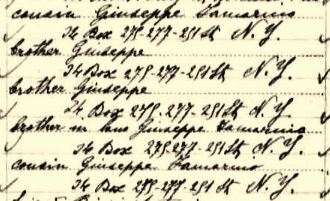 His birth record said his parents married in December 1891—that's 6 months after he was born. It says they got married to make this baby legitimate. OK, maybe that's not such a big deal (although this was 1891). But the couple's marriage document shows that the mother of the baby—the new bride—was 14 years old. The father, Francesco, was 25. As ewww as that is, there's more. Francesco first got married in 1888 to a woman who must have died by mid- to late-1890. And while this wasn't uncommon, the then 13-year-old girl he got pregnant in late 1890 (that part IS uncommon) was the half-sister of this first wife. How do you think that went? The little girl is consoling him over the loss of his wife, her sister, and it winds up getting physical? Bye-bye childhood, Isabella. It's mommy time. I found one more twist to this tale. Another shotgun wedding. 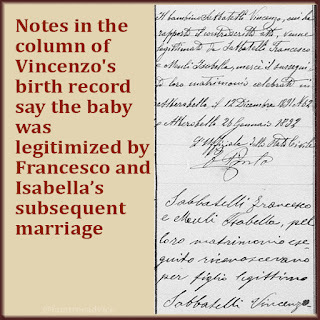 Francesco, who made baby Vincenzo with 13-year-old Isabella, was also born out of wedlock. His birth record also says that his parents married to make the baby legitimate. Francesco's father, also named Vincenzo, was 30 years old when he married for the first time. His wife, already the mother of his child, was a widow and only 23 years old. Maybe this is how they consoled widows and widowers back in the day! My cousin who wanted this information isn't online. I'll have to print out the information and documents and mail them to her. I'm still trying to figure out how to lay out these facts as clinically as possible. I'm expecting a few more plot twists ahead. My 5th Great Grandfather: A Random Act of Kindness? My grandpa, Pietro Iamarino, in New Brunswick, NJ. My Grandpa lived in the same house from the time I was born until two years before he died. Whenever my family was in the Bronx, we stopped in to visit him. All those weekend visits to the orthodontist when I was a kid with braces, my dad and I would stop in to visit Grandpa. Years later when I was grown, I made the trip from New Jersey to visit Grandpa. Yet Grandpa had been so many places. In 1920, at age 18, he left home in Italy to come to America. After Ellis Island, he went north to a Boston suburb. There he joined his mother's brother, Antonio Pilla. Grandpa was quick to declare he was staying in America. A short time later, Grandpa was in western Pennsylvania working as a laborer. There, in 1924, he filed his Declaration of Intention to become a citizen of the United States of America. He was still in Pennsylvania three years later when he became a citizen. Now an American citizen, Grandpa didn't seem to have a steady job or profession. His next move, I think, was his family's suggestion. Grandpa moved to Ohio. married his landlord's daughter, and his third cousin, Lucy Iamarino. But Grandpa wasn't finished with his travels. After the steel mill he worked for the railroad along with Pasquale Iamarino. He famously said his railroad job "stinks on the ice," so he packed up his wife and two kids. They moved to the Bronx, New York, and lived for a time with Grandpa's uncle Giuseppe. Grandpa became a jeweler—a much cleaner job than working in a mill or a railyard. He continued his nice, clean jeweler's job in the Bronx for almost 15 years. But he wasn't finished. My grandmother became ill and wanted to move back to Ohio near her parents. So that's where they went. On her deathbed in 1954, my grandmother told my dad to go back to the Bronx and marry his childhood sweetheart—my mom. By 1955, my parents had married and had a child. They invited Grandpa to live on the first floor of their townhouse in the Bronx. Yup. He was back in the Bronx. In 1959 Grandpa remarried and bought the house where I would visit him for the rest of his life. I wanted to map out Grandpa's travels from Italy to New York to Pennsylvania to Ohio to New York to Ohio to New York for one reason. My Southern Italian grandfather did NOT take a ship from Naples to New York like all my other relatives. That would have been too direct for him. 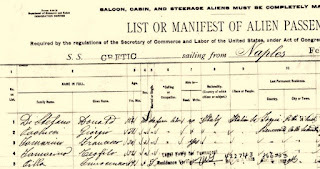 When I began my genealogy research in 2003, the first document I found was Grandpa's ship manifest. I didn't understand why, but his manifest didn't say "sailing from Napoli". It said "sailing from Cherbourg". That's in France. Northern France. Cherbourg is a 24-hour car ride from Grandpa's hometown of Colle Sannita, Italy. 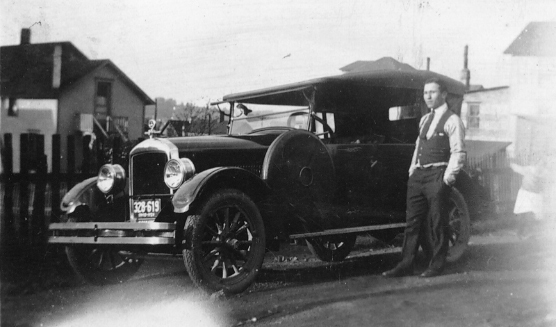 And you know 18-year-old Grandpa didn't take a car that distance in 1920. I imagine he traveled for weeks to get to northern France. And then he spent 12 days on the Atlantic Ocean. I have no documentation of that part of Grandpa's journey. He never spoke about his early life. Judging by the rest of his travels, I'd like to think he acted like a student backpacking his way through Europe. He traveled for a while, stopped to do some odd jobs for money, and continued his way north. Oh, he did make one other journey. In 1958, before he remarried, he made a trip back home for the first time since 1920. His father Francesco had traveled back and forth from Italy to America five times! He had visited Grandpa in Ohio in 1929. But Francesco died in 1951. Grandpa did get to see his mother one last time during that visit to Italy. Imagine that? He left home as an 18-year-old boy and didn't see his mamma again until he was a 56-year-old man. Aha! Now it seems like fate that I've lived in New York, California, New York, Connecticut, Indiana, New Jersey, Pennsylvania and New York. I am, after all, an Iamarino. Where Did Grandpa Come From? have a view of the Statue of Liberty. When I visited Ellis Island a year ago, I felt chills. It was emotional to think my ancestors had stood on the very same spot long before me. The first ship manifests I downloaded years ago fascinated me. Sure, they give us important facts about our ancestors. But they can paint a little picture of the voyage. Sometimes a group of travelers from one town made that ocean voyage together. The group may include entire families or a few brothers and cousins. Other times it seems as if all the young men in town made the decision to find their fortunes together. Often you'll see a woman making the journey with her young children to join her husband who went before them. These five young men came to New York together from a small Italian town. I'm related to at least three of them. 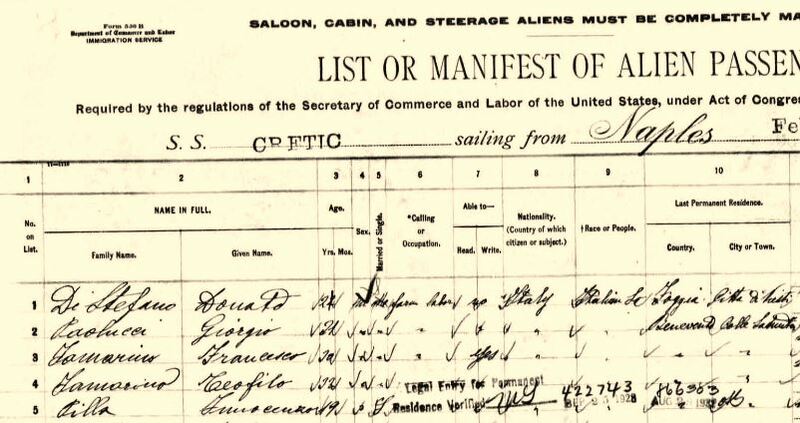 Most of my ancestors spent three weeks in steerage sailing from Naples, Italy, to New York. The 2015 movie "Brooklyn" gives you an idea what that difficult trip may have been like. But "Brooklyn" takes place in the 1950s. I suspect her seasick journey was a lot nicer than my ancestors' voyages between 1890 and 1920. When I've flown to Europe or California, I arrived looking like death warmed over. But here's the worst possible scenario. 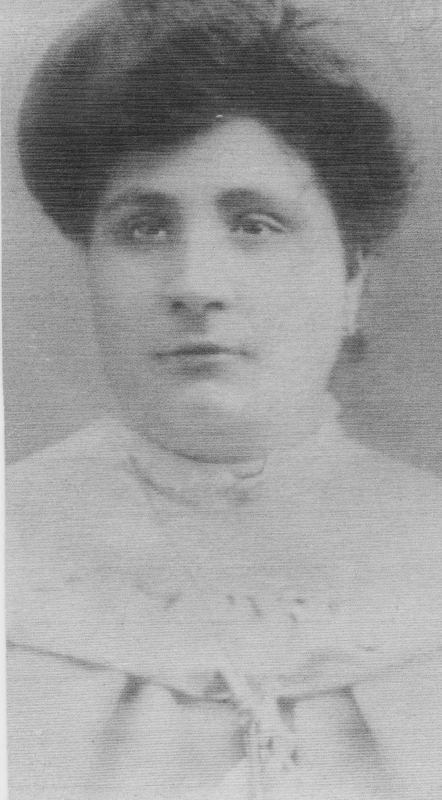 My great grandmother, Maria Rosa Saviano, was five months pregnant with my grandmother when she boarded the S.S. Karamania in 1899. Think about that. Three weeks in crowded, foul-smelling, uncomfortable conditions. At least some amount of rough seas. No room to move and very little fresh air. And you're five months pregnant! That was one tough lady. 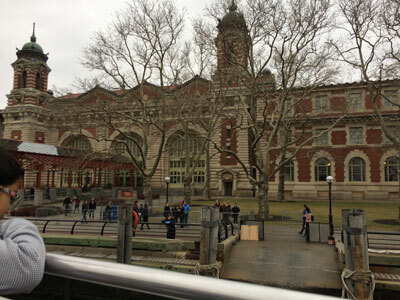 The museum at Ellis Island lets you walk where your ancestors walked. It shows you what the inspection process was like for them. 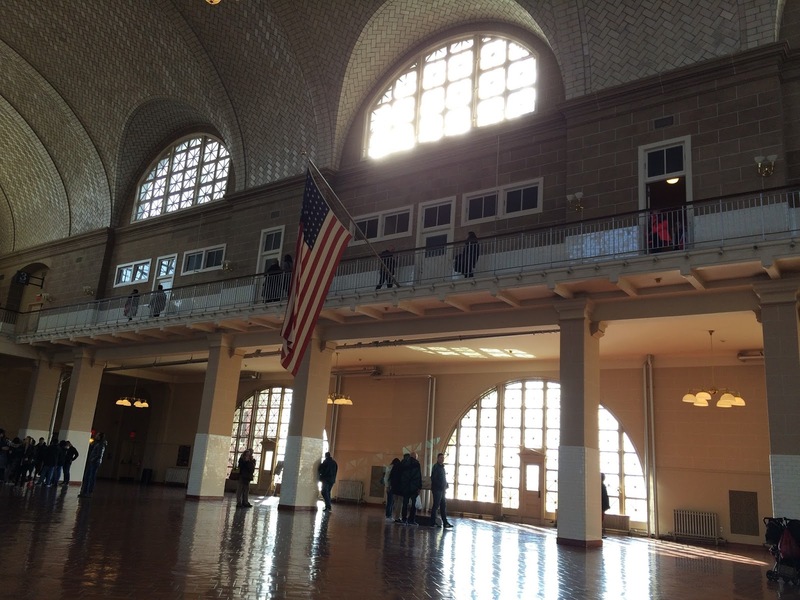 Were any of your ancestors detained at Ellis Island? Were they sick and quarantined? Women and children were sometimes held until a relative arrived to take them on their way. For an excellent description of the entire immigrant journey—from hometown to port to voyage to Ellis Island and on to their final destination—read "The Immigrant Journey" on OhRanger.com. What sacrifices did your immigrant ancestors make? Don't take their strength and courage for granted. The last time, I wrote about how important it is to be ready for the sudden loss of your computer. You must be prepared to move your genealogy files if your computer is about to die. And sure, you'll have to move non-genealogy files, too. I'm lucky that my 4-year-and-8-month-old computer gave me warning that it was on its last legs. Every program I tried to run was unresponsive. I had to move on to new technology. A tool to fix the problem. When I launched Family Tree Maker on my new machine for the first time, I was surprised that it displayed my media files. I have 2,634 images attached to people in my tree. They are mainly census forms, ship manifests, and photos. I was surprised to see them because the file structure on my new computer is different. I'm storing all my genealogy images on the "E" drive, which is enormous. It turns out I made a bad choice when I first began using FTM in 2003 or so. The program asked me if I wanted to save media files in the family tree file, or link to their location on the computer. I figured that saving the media in the file would make the file way too big. So I linked to them instead. I knew I couldn't move files around or rename the files or folders. They would become unlinked if I did. I accepted that, and I never changed anything. Imagine my face two days ago when I realized all my media was now unlinked! 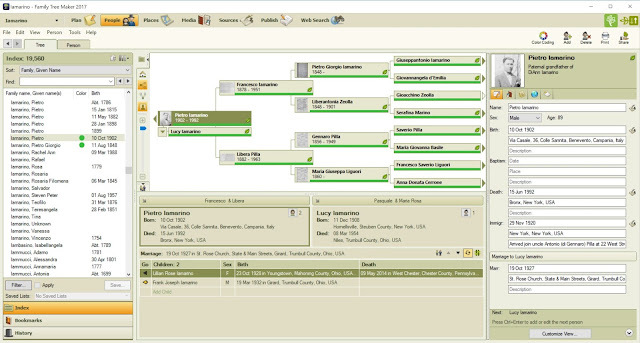 Thankfully, Family Tree Maker has a fix for this. I hope your family tree software does, too. 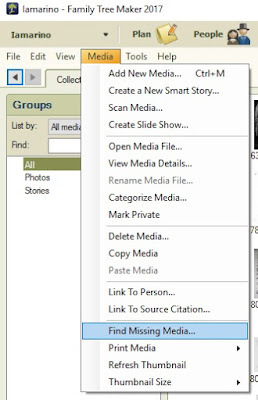 If you're not sure, check your software's website or click the Help menu to see what it says about media files. In Family Tree Maker, I clicked the Media menu and chose Find Missing Media. This brought up a window showing the long, long list of my 2,634 missing media items. "Click to search manually"? No thanks. In the right column, labelled Attach, there's a choice between Attach a Copy and Attach a Link. I'd always chosen to attach a link before. Here was my chance to bring a copy of every single media item into my Family Tree Maker file. Sure, my family tree file is going to be much fatter than it used to be. But I've got a 1 terabyte hard drive now, so who cares? The process is very simple, but as I write this, it's still running. 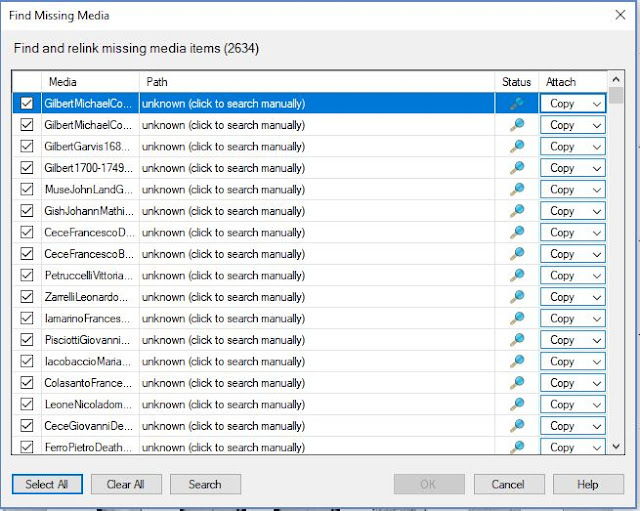 All I had to do was click to Select All, make sure the Attach column was set to Copy, and click Search. Immediately, I saw that the program found my files on my new E drive. So it's working! It's more than halfway done, and progressing nicely. Better graphic cards make working on your family tree easier. I would have been pretty upset if I had to locate the 2,634 images one at a time! But let this be a lesson to you. If you plan to move your family tree to a new computer, and your file doesn't contain all the images, pull them in now. And here's a nice benefit to upgrading that computer. Aside from it being faster, I've got a really high-resolution screen. So I'm able to see so much more of my family tree at a glance than before. At this point, my house contains more obsolete computer equipment than it should. But genealogy is a high-tech hobby. It pays to have good tools for the job. I'm so lucky. All of my ancestors who emigrated sailed from Naples to New York between 1890 and 1920. The only document collection I need is "New York Passenger Lists". And every one of my people went through Ellis Island. The ship manifest—the list of passengers on a particular ship for a particular journey—can tell you your ancestor's hometown. That alone is a significant boon to your genealogy research. It can lead you to their foreign vital records. I'm more excited to find an ancestor who arrived in the U.S. in 1909 or later because there is likely to be a two-page manifest listing extra information. Not a nuclear family, but 4 out of 5 of these men are mine! And they were all going to the same place! Are-you-a-deadbeat type questions, such as were you in prison, an almshouse, or supported by charity? Are you coming here because of a job offer? Are you deformed or crippled? These are the blanks to be filled in for each person, but there is another set of facts for a genealogist to crave. Family members! Sometimes you'll find an entire family traveling together. Or you may see a mother and her children, and the manifest will show the name and address of her husband who is already in the United States. Jackpot! Your ancestor's ship manifest—assuming they did not sail so early that no questions were asked—should be the first thing you search for. You can't go back overseas and get that birth certificate if you don't know your ancestral hometown. Not sure where to start? Check the census for your ancestor. It may include their immigration year.